At Pear Stairs, we are proud to offer the people of London a wide range of staircases and stair parts that reflect the diversity of the world’s greatest city. 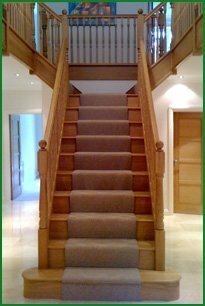 Our online shop stocks everything you could need to improve your new or existing staircase. So, whether you need balustrades for Buckingham Palace or spindles for St Paul’s, we have it all - just a few clicks away. You don’t need to live in a palace in London to be able to afford our quality stair parts and staircase products because our prices are very competitive, and the wide range we have on offer will suit any size, style or budget. 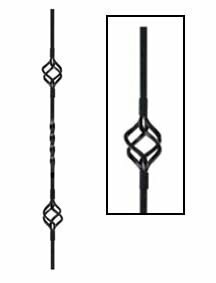 We stock banisters, balustrades, newel posts, newel caps, metal spindles, wooden spindles, stringers, steps and much more. The city of London is the heart of this great nation just as a staircase is the heart of any home. At Pear Stairs, we understand that a staircase is more than just a piece of functional furniture; it is the focal point of a household, used by all the family. The stair parts that make up your staircase can really make an impact on guests as they are welcomed through your front door, so whether you have a traditional town-house or a minimalist modern apartment, we have the stair parts ready to make your staircase dreams a reality. We stock banisters, balustrades, stringers and spindles in oak, ash, walnut, pine, hemlock and many other top quality hardwoods. 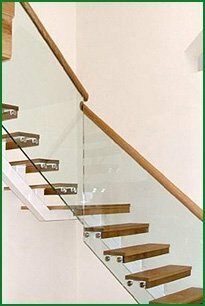 We also have a range of metal and glass stair parts, such as glass steps and metal spindles, and you have the freedom to mix them together as you see fit. Many great artists, designers and architects were born, worked and lived in the city of London, so if you are feeling creative why not try out our online 3D design studio software, and build the staircase you’ve always wanted. You can pick and choose the stair parts you desire in the materials you want, and our software will make a 3D model of your creation. It’s easy-to-use, and it’s all absolutely free. It’s designing step-by-step - literally! If you’d like a little inspiration before you get creative, then why not browse through the pictures we have in our online gallery. All the pictures have been supplied by thousands of satisfied customers. London has a rich history spanning royalty, Romans, and the Renaissance, stretching back into antiquity. We may not have been around as long but at Pear Stairs we have over one hundred years of experience in quality, craftsmanship and traditional values. Not only do we have the experience and respect for tradition, but we also look to the future and have invested in some of the world’s most sought-after technology which allows us to produce and manufacture high quality stair parts at affordable prices. Our friendly team consists of some of the best designers and experts in the country and they are ready to make your staircase dreams come true. Please don’t hesitate to contacts us at Pear Stairs via our website, or just by dropping us a call with any questions you might have.